SaltWorks®, based near Seattle, Washington, is the biggest gourmet salt company in the world, supplying and manufacturing premium-grade, specialty salts to the wholesale, retail, and consumer markets. Orders for salt run the gamut from single jars sold from their website to multiple ocean containers. SaltWorks offers customers over 110 varieties of gourmet salts from around the world, including salt from the pristine waters of the Pacific Northwest. Instead of large rigid structures in their 130,000 sq ft plant, SaltWorks utilizes small mobile processes that give them the flexibility needed for processing their wide variety of salts. However, their mobile process initially included large overhead cranes for lifting one ton super sacks above stationary equipment. But adding one ton of salt to a hopper was very taxing on equipment. SaltWorks was very impressed with the design of the DynaClean conveyor systems when they first saw them on display at a PackExpo trade show. SaltWorks recognized that a DynaClean Z-Style conveyor would incorporate well with their mobile process and give them the ability to slowly meter the salt into their hoppers. The DynaClean conveyor has given SaltWorks the opportunity to use the conveyor with several applications. 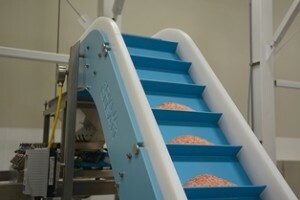 In one application, the DynaClean conveyor feeds Ancient Ocean Himalayan Pink Salt to a sample pouch machine. The conveyor allows the salt to continuously fill the hopper, without putting excess weight on the vibratory feeder. With decreased weight on the feeder, SaltWorks is getting less variance in their fill weights, which has increased their quality and reduced their reject rate to less than 1%.